Today I have a super easy and yummy recipe to share with you all. This is a favorite in our house as it’s tasty, but really it takes all of 5 minutes to prepare. 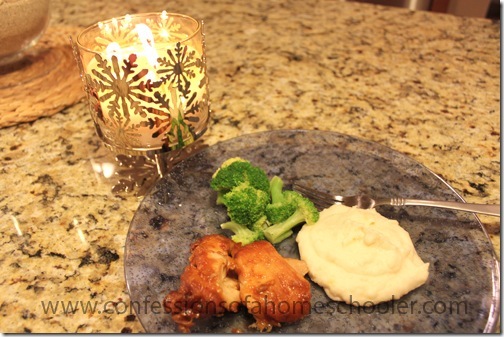 And for a homeschooling mama, that puts it on the top 10 list of meals! 1. Turn crockpot on low. 2. Place chicken breasts at the bottom of the crockpot. 3. Mix remaining ingredients together and pour over chicken. Put lid on crockpot and cook for 3-4 hours for thawed chicken breasts, or 6-8 hours for frozen chicken breasts. 4. Curl up in your favorite easy chair and have a few bon-bons. I mean…go homeschool the kiddos knowing that dinner’s already cookin’! Once dinner time rolls around, serve over a bed of rice or with mashed potatoes and veggies. I also like to add in a salad just to get those veggies in! 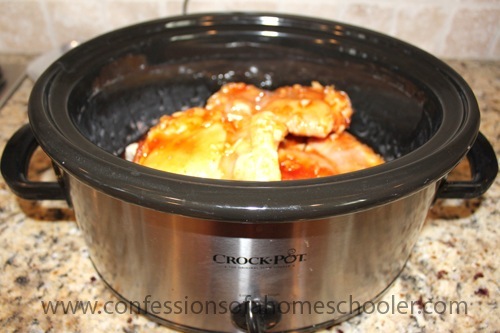 Place chicken breasts at the bottom of the crockpot. 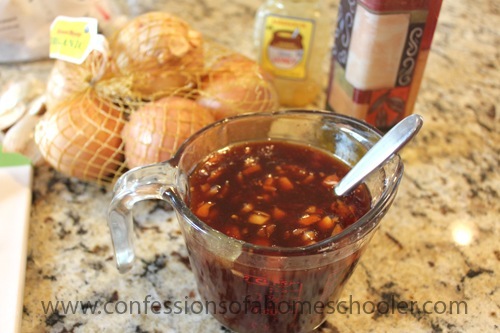 Mix remaining ingredients together and pour over chicken. Put lid on crockpot and cook for 3-4 hours for thawed chicken breasts, or 6-8 hours for frozen chicken breasts. This is perfect timing because I was JUST making a list of crock pot meals and this recipe popped in my inbox! I wonder if you could prepare this ahead and freeze it? Thanks!! Katie, yes you can make ahead and freeze! I’ve done this before. Thx for sharing and reminding me to make it Erica! Anyone have any tips for crisping up the chix before serving? I don’t like mushy chicken from crock sometimes. Thx! Yes, you can add the raw chicken and sauce to a Freezer ZipLoc baggie then freeze. When you need it for dinner just thaw and put in the crock pot! Thanks for dinner for next week. Made this tonight and my girls loved it and so did hubby. Thanks! Thank you! Will definitely have to try this out. At what point would you freeze it? This is something I need to start doing with a new baby coming very soon! 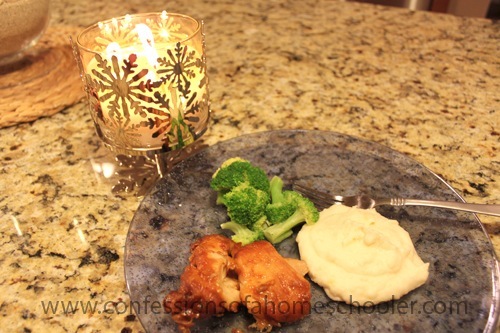 I made this chicken today in a pan and it came out wonderful! This is definitely a keeper. Made this yesterday and my 8 yr. old boys loved it! Thanks for a great, simple recipe.